E.M. Mnzava is Director of Forestry, Forest Division. Ministry of Lands, Natural Resources and Tourism. United Republic of Tanzania. This article is adapted from a study he completed for the Government. Once the need to plant trees - whether for fuelwood, food, fodder, shelter, income or environmental protection - is accepted and made a part of government planning, methods must be found to make such an effort successful. E.M. Mnzava discusses what has worked - and what has not worked -in the United Republic of Tanzania in this regard. If the Tanzanian experience can be summarized in one simple statement, it is this: listen very carefully to what the villagers themselves have to say. · More than 87 percent of the United Republic of Tanzania's population of about 19 million people live in rural communities. These communities depend chiefly on biomass energy for their household and village or cottage-industry activities. Fuelwood (including charcoal) is the principal energy source, accounting for about 96 percent of the total. More and more urban residents (especially those in the low-income brackets) are using fuelwood, particularly charcoal. More than 85 percent of residents in towns use charcoal alone or an "energy mix" with other energy sources (Nkonoki. 1981). For instance, between 1978 and 1982, charcoal consumption in Dar-es-Salaam increased from 120-150 to 315 kg a person a year. Thus, Tanzania is the second largest fuelwood user in Africa (after Nigeria), with a per caput consumption of about 2.5 m³ a year (Nkonoki, 1981). Like many other developing countries, it uses little commercial energy for cooking. The current fuelwood consumption is estimated at 35 million m³; it is expected to rise to about 62 million m³ by the year 2000, when the population will have almost doubled - to 35.7 million people. The natural forest formations, from which more than 98 percent of the wood is collected, can supply only about 19 million m³ without being detrimentally overcut. To bridge this energy supply-demand gap, a massive amount of tree-planting is needed. The natural forest is shrinking very fast, and most alternative energy sources have had no significant impact so far. Either they are physically and economically unavailable or their technology is still relatively new and more time is needed for further development. Despite clear evidence that most villagers know what species they want, most foresters are still using their traditional shopping list of criteria in choosing species - multipurpose, fast-growing, coppicing and so on - without taking villagers' needs into account. For example, one of the main reasons tree-planting is failing among the Masai communities is that they are often given species only for firewood, like eucalyptus. The Masai are a unique pastoral group. Livestock is their life! Their main foods are meat and milk, and they keep large numbers of livestock in a harsh environment to meet family subsistence needs. As they have explained time and again, what they need is species suitable for their animals. When they are given unsuitable eucalypts, the trees are neither planted nor looked after and the blame is put on "pastoral conservatism". This "top-down" choice is also reflected in the preference for exotic species over indigenous ones. The former are often claimed to be fast-growing, and this is true in many cases. But the fact that some indigenous species are more adapted to the environment and to local needs also merits serious consideration. Many trees that used to yield fruit for farmers when they were cultivating fields, gathering fuelwood and herding livestock are now gone. So choosing indigenous species is not a question of "indigenous is beautiful"; rather, the indigenous species are likely to be more useful for meeting farmers' many needs. There are some species, for example, that farmers do not cut during farming: the Gogo do not cut down the baobab tree, not because it is too big, but because it has many uses. By the same token, farmers like trees that add fertility to the soil - nitrogen fixers - though they do not necessarily understand the mechanism by which this fertility is added. Finally, villagers, especially women, know the energy utility of most trees species. They know those trees that give little caloric value, burn too quickly, give too much smoke, produce too much ash and even spot-fire, thus presenting a real danger to grass-thatched houses. For example, a study done by the University of Dar-es-Salaam on the acceptability of charcoal from softwood among local communities revealed that the market was unwilling to buy the charcoal despite the effective caloric value/unit weight - almost the same as that of the favoured hardwoods - and despite the fact that the price of the softwood charcoal was reduced by 50 percent. The main problem seemed to be the relatively quick burning of the charcoal and the fact that it produces more smoke. However, with acute shortages, more energy sources considered inferior are being accepted. With "wandering" livestock it is difficult to keep tree and wood-lot damage to a minimum, especially considering that villagers often keep more livestock than is commensurate with the land-carrying capacity. More than 92 percent of all nurseries catering for villages are still located at regional and district levels. A relatively small percentage are owned by the villagers. One of the reasons often given for this is that villagers lack the expertise to look after them. In fact, most farmers normally run their own small nurseries in raising agriculture crops such as coffee, which is a tree. Are forestry trees really so different? As a result, seedlings have to be transported long distances, sometimes even beyond 50 km. The inadequacy of transport is one of the major setbacks in tree-planting, in terms of both availability and cost. The practical approach is to decentralize the nurseries as much as possible. In order to attain economies of scale, and since not all villages have the necessary conditions for nursery establishment - like ample water supply - several villages could jointly run a nursery whenever circumstances permit. Data indicate that such nurseries are best located in primary schools (normally parts of villages), where there is an infrastructure and more expertise. Neither the government-owned nor the village nurseries are raising enough seedlings at the right time. The main reason seems to be inadequate resources, combined with the fact that utilization of locally available materials is neglected. A good illustration is the use of polythene seedling pots. Since polythene is a petroleum product, it is often in short supply. Yet foresters sit and wait for these tubes for several months. No wonder that 7090 percent of all late tree-planting between 1970 and 1980 was attributed to the late arrival of these polythene rolls in the regions and districts. There are other options. Villagers have been using banana peelings to make coffee-seedling pots for ages. Of course, banana plants are not spread all over the country. Earth balls (a ball-like pot made from clay and other types of soil) have also been tried at the Sao Hill Forest Project. They have been found to provide a reasonable amount of tree survival and are low in cost: almost two-thirds lower than a polythene tube. The general land-use pattern includes 43 percent forest land, 50 percent rough grazing land. 4 percent smallholder cultivation, 1 percent large-scale farms and 2 percent urban, rocky or swampy areas. Most tree-planting and wood-lot establishment is done on the grazing, smallholder and large-scale farming land. And here is where most problems are encountered. On the rough grazing land, livestock herding is "free-range". Among the Masai, for example, seasonal movements in searching for pasture can involve travelling up to 20 km (Moris, 1981). Eighty-five percent of the respondents in the 257 villages surveyed by the author in Dodoma in 1971-72 said they did not have enough land for grazing. This figure was higher - 94 percent - when the survey was updated in 1979-80. Therefore, with "wandering" livestock it is difficult to keep tree and wood-lot damage to a minimum, especially considering that villagers often keep more livestock than is commensurate with the land-carrying capacity. On the smallholder farming land the situation is not much better. Most of the human and animal population is located here, and problems are compounded by the traditional land tenure used in some parts of Tanzania. In Kilimanjaro, for instance, under the "Kihamba system", land is normally inherited by sons and land fragments are continuously subdivided through generations. Land is now so fragmented that some villagers have to migrate to other regions. In fact, the Government gives some assistance to this migration. Under these circumstances, tree-planting, if considered at all, is pushed to rocky, infertile and swampy areas. Finally, much of the land adjacent to villages in many heavily populated regions is legally reserved forests, wildlife habitats and national parks. Thus, most of such land is out of reach for local communities. Wherever land is a limitation, villagers should be encouraged to "plant trees outside the wood-lot". They do not have to set aside specific areas: planting in built-up areas and planting along their farm boundaries are rational options. Tree-planting along roadsides outside their villages, as advocated by many foresters, should not be their responsibility. Who then would look after the trees? Local government and non-government organizations are better placed to perform this task. The stereotyped notion that standing trees must be cleared away to create new land for wood-lots must be changed. There are many cases in villages where the natural tree formation only needs to be "enriched" by planting in the gaps - possibly with indigenous species. This has been tried in Mbulu, Mpwapwa, and parts of Iringa and Mbeya. It works. One of the main reasons tree-planting is failing among the Masai is that they are often given species only for firewood, like eucalyptus. The inadequacy of transport is one of the major setbacks in tree-planting, I in terms of both availability and cost. The existing procedure is that the Forest Division raises seedlings and distributes them to villagers, but still continues to provide extension services until the benefits are realized. It is not true, as Douglas et al. 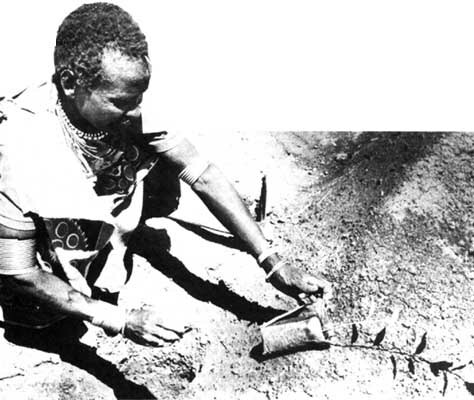 (1982) claim, that "social forestry [tree-planting in this case] stops at the seedling distribution stage in ... Tanzania". Nevertheless, Tanzania's programme is not as successful as those in India, the Republic of Korea and China. One of the main problems in tree-planting, and especially in communal wood-lots, is the coincidence of this planting with agricultural crop plantings and their subsequent maintenance. How does one reconcile these two work schedules? When there is a conflict, crop-planting is naturally a clear winner. The rainfall in many parts of the semiarid areas (Dodoma, Maswa, Ngugu and Magu districts and so on) is so unpredictable and unreliable that missing one right day for planting may mean curtailing the whole season's crops. Under the principle of "safety first" villagers therefore plant food crops before they plant trees. Villagers interviewed by Scutsch (1982) reported that there was no shortage of labour for tree-planting or maintenance. 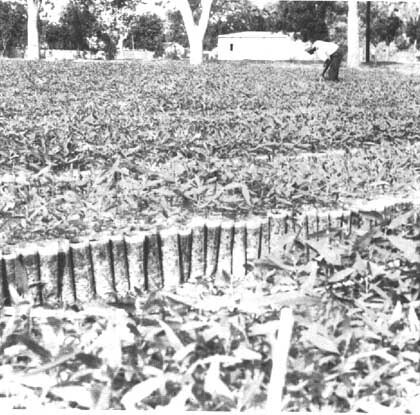 As will be seen below, a lack of adequate labour when it is needed is one of the causes of wood- lot failure in a number of villages. In certain cases, targets for planting in the establishment of wood-lots are not realistic. For example, the World Bank Reforestation Project in Tabora to produce fuelwood for tobacco-curing has not fully succeeded, partly because of over-ambitious targets. Each village is supposed to plant 25 ha annually in addition to its tobacco-growing and processing activities (which are very time-consuming). Experience, however, indicates that a village can plant only 2-5 ha a year. People's participation is a magic phrase which appears in every rural development project or programme. It is used so often that many writers no longer bother to explain who is participating, at what level and for what purpose. In some instances, bureaucrats use participation cosmetically in order to popularize projects or for their quick approval by politicians or donors. Participation is frequently accomplished by meeting with villagers and setting up committees which rarely meet. It is through these committees and meetings that bureaucratic "top-down" decisions are blessed. As a whole, however, such an attitude is not strong in the rural Tanzanian sector. The decentralized reforestation programme was formally started in 1967-68. The villages are the nuclei for the programme, though private organizations and individuals are also actively involved. Under the programme, the central and local governments raise tree and fruit seedlings and distribute seeds. They also supply extension services, including the occasional provision of loans and credit from the Tanzania Rural Development Bank and other agencies. The local communities participate in preparing the planting site, planting the trees and maintaining them. When the trees are mature, the villagers harvest them. They either share the fuelwood or sell it, in which case the money is often deposited in the common purse for other communal activities. Local governments, especially the district councils, also play a key role in reforestation for energy and environmental reclamation. They own plantations in addition to distributing seedlings to villagers. Recently, non-governmental agencies, especially churches, have been active in distributing seedlings, establishing fuelwood plantations and teaching people how to care for trees. Primary schools have been particularly effective. Finally, certain foreign donors are also involved. The Swedish International Development Authority (SIDA), the US Agency for International Development, and the Oxford Committee for Famine Relief (Oxfam) are noteworthy. The advantages of involving local organizations, especially villages, are obvious. In addition to raising the people's awareness of energy and environmental problems, this approach helps people to help themselves. In so doing, the country saves labour and money which can be used in other sectors (see table). Local participation is not, however, without limitations. First, weak village leadership contributes directly to delays over deciding whether to plant trees or not; and then, even if trees are planted, it can retard or neglect maintenance. Second, in the village organization, as well as in some households, women are little involved in decision-making in tree-planting and other activities. This happens also in open meetings. For example, of the 257 villages surveyed in Dodoma in 1971-72, the meetings in about 89 percent were attended by women, but only in 7 percent of them did women participate in the discussions. Women's work is often so demanding that they barely have time to relax, let alone to plant trees. Third, the national women's organization, Umoja wa Wanawake Tanzania (UWT), is fairly active in organizing local women for various projects, but it is hardly involved in any kind of fuelwood- or tree-planting. Fourth, in the village set-up there seems to be no one charged with the responsibility of organizing tree-planting. Although it may not be feasible to form a committee on tree-planting, at least a subcommittee should be considered. Last, the linkage and coordination among villages need strengthening. If, for instance, a village has a nursery, its should share seedlings with neighbours on whatever terms can be agreed upon. Experience indicates that food, fuelwood and income are the major concern of the 1980s. EUCALYPT SEEDLINGS READY FOR PUNTING are local species better? Like many developing countries, Tanzania is facing a serious decline in forest resources which has, in turn caused shortages in fuelwood and its derivatives. Most people are aware of this problem. In Malawi it is reported that many farmers are now planting trees. The same has been reported in the Sudan and other Sahelian countries; India (Gujarat); Indonesia; Thailand; the Republic of Korea; China; and Peru, to mention but a few examples. A common denominator in these countries is that the farmers are involved. In fact, in most countries they are the main decision-makers. Further, it is clear from the experiences of these countries that tree-planting is not so much a technical issue. Rather, it is a socioeconomic problem. And experience indicates that food, fuelwood and income are the major concern of the 1980s. So the fuelwood "crisis" must be solved in the context of broader issues. One of the principal focal points should be meeting food and agricultural needs through forestry. The FAO/SIDA mission on Forestry for Local Community Development visiting some parts of Tanzania in 1982 reported that it was evident that there was "genuine official acceptance... and a real awareness of the needs of the people on both the political and technical levels of government in the area". Similar commitment has been observed in Mali, the Niger, Senegal, the Republic of Korea and China. One fundamental difference between Tanzania and other countries, however, is that once seedlings are distributed in Tanzania, the government interferes little with villagers' activities. This is not to say it does not provide extension services. But it does not, for example, plant the trees for villagers and still call the result a "village wood-lot". Also, the ujamaa village organization can be a unique base for people's participation, if properly utilized. It offers a two-pronged attack on the problem of tree shortages by encouraging planting by individual households as well as collectively by a village. What do the farmers expect of us foresters? They expect us to respect their "household policies" upon which government policy is, or should be, based. In this case our major role should be to look for opportunities to help them rather than guarantees that tree-planting will always be successful. And the real challenge facing the foresters is to help the farmers until eventually they manage everything on their own. · All efforts must be made to decentralize nurseries as much as conditions allow, so that they can be run, with advice from the government, by non-government institutions as well as the "model" tree-planters like those already operating in the Mbulu district. · Wherever it is possible, villages should be encouraged to sell any surplus seedlings to their neighbours. This will primarily involve fruit seedlings, since most other seedling types are given away free. · Attempts already under way to concentrate tree-planting, rather than trying it everywhere, should be continued. · So far, tree-planting has not made use of the credits and loans given by various institutions such as the Tanzania Rural Development Bank. These credits and loans could possibly alleviate the problem of labour competition (e.g., between forestry and agriculture). 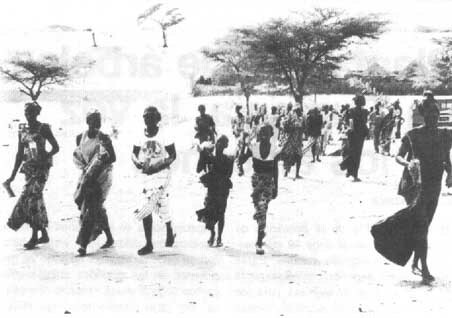 · Tanzania's 1978 Village Act allows villagers to retain the forest products fee so long as exploitation is done within their village. But this money is not ploughed back into forest activities. This is something that should be made a condition for the fee retention. · At present the extension workers, especially those below district level, are not well motivated; they have no incentives at all. A study to find practical means to motivate them would help. In the meantime, they should be allowed loans for bicycles and motor cycles, since a large part of their extension service is greatly hindered by lack of transport. · To serve the villagers better, the Forest Division must be further decentralized, with more responsibility going to the divisional and ward levels. · Training has not been able to keep pace with farmers' extension needs. Between 1971-72 and 1982-83, only 858 certificate students, 691 diploma students and 150 graduates with degrees were trained. Expansion in training and education needs urgent attention. · Finally, Nkonoki (1981) suggests the setting up of permanent rural energy committees to plan and advise on overall rural energy at village, ward, divisional and up to regional levels. Experience indicates that committees are over-enthusiastic at the beginning and later lose momentum. Since some committee members may not necessarily understand the intricacies of rural energy, such committees can become arenas for unnecessary arguments rather than practical working groups for solving people's problems. The more specific the assigning of responsibilities, the better. It is easier to talk about such solutions than to implement them, but a clear notion of what is possible and what is not is an important first step. The United Republic of Tanzania has now made that step. DOUGLAS, BARNES F. et al. 1982. Social forestry in developing nations. Resources for the Future discussion paper D.73 F. Washington, D.C.
FAO. 1980. Village afforestation: lessons of experience in Tanzania, by Elifandhili M. Mnzava. Rome. FAO. 1982. Support to village afforestation in Tanzania, by David Brokensha. Survey of Wood Fuels Supply Needs, consultant's final report. Rome. MORIS, JON R. 1981. A system perspective. In Managing induced rural development, p. 57-58. International Development Institute, Indiana. NKONOKI, SIMON R. 1981. The pour man's energy crisis. In A report of the Tanzania Rural Energy Consumption Survey. SCUTSCH, MARGARET. 1982. Why people don't plant trees, a case study of social forestry in Tanzania (draft report), pp. 1-10. Resources for the Future. Washington, D.C.
SWEDISH INTERNATIONAL DEVELOPMENT AUTHORITY (WITH Ethiopian Forestry and Wildlife Conservation Development Authority) 1983. International Seminar on Community Development report, p. 1. Stockholm. THOMSON, J.T. 1981. Public choice analysis of institutional constraints on fuelwood production in the West African Sahel. In Public choice and rural development Resources for the Future research paper R-21. Washington, D.C.
WINTERBOTTOM, ROBERT T. 1980. Reforestation in the Sahel: problems and strategies, p. 22., Paper presented for the African Studies Association Annual Meeting, Philadelphia.